At New York Old Iron in Brooklyn’s Gowanus section, under the F and G subway train tracks, rows of reclaimed clawfoot tubs and old pedestal sinks are piled end to end. Some are chipped. Some are yellowing. Others are encrusted with decades of grime. But to the homeowners and apartment dwellers who roam the cluttered aisles of this and other architectural salvage outlets in New York, New Jersey, and beyond, those blemishes are hardly a deterrent. Their nicks, dents, and age spots are seen as signs of character — especially if they fit into a design scheme that calls for styles of an earlier era rather than new furnishings made of modern materials. The stacks of old doors and mantels at Philly Provenance, the ornate chandeliers at Philadelphia Salvage, and the reclaimed beams and flooring at Recycling the Past in Barnegat all represent a growing trend in reusing and reclaiming articles from the past to furnish homes of the present. But not all salvage is vintage. At Green Demolitions’ locations throughout the tri-state area, whole kitchens that are nearly new and completely functional sit waiting to be reclaimed. And they can represent considerable cost savings. Following is a sampling of some area architectural salvage operations. Some are new; others have been around for decades. Many have a particular area of expertise. 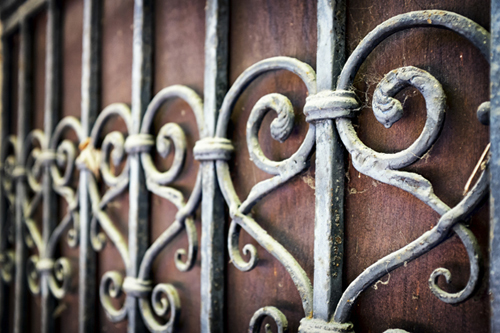 All offer a range of items, from intricate door hardware to imposing wrought iron gates. Amighini Architectural, Jersey City: Need a mahogany entrance door for that brownstone you just purchased? How about some stained glass windows? Amighini Architectural might be your go-to place. The salvage yard, in operation since 1945, has a huge supply of doors and also sells wood paneling, restored columns, iron gates, outdoor furnishings, and much more. The company also offers rentals of how-to videos and movies for do-ityourselfers. Find them at 246 Beacon Avenue, Jersey City. 201.222.6367 or info@amighini.net. Recycling the Past, Barnegat: This is one of the largest salvage companies around. The more than 80,000 square feet of space is home to a revolving collection of doors, windows, lumber, stone, tubs, industrial salvage, and vintage artifacts from residences and industrial buildings. A particular niche is aircraft and marine salvage. 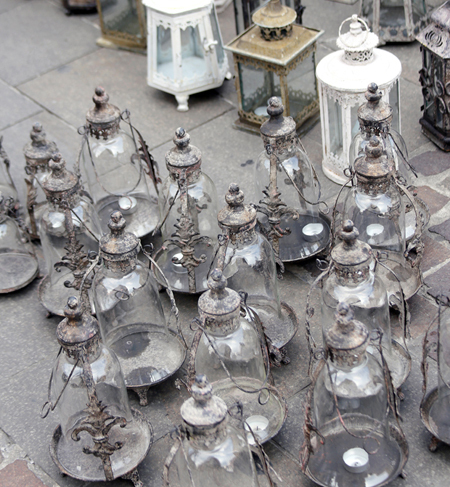 And don’t forget to check out the huge selection of garden antiques. 381 North Main Street, Barnegat. 609.660.9790 or recyclingthepast.com. Philly Provenance in Philadelphia, subtitles itself “Old Soul Architectural Salvage.” Their unique inventory comes from some of the city’s most historic landmarks. A recent scan of the company’s website revealed pressed tin ceilings, reclaimed wood, brick, and stone, an old Horn & Hardart Retail Shop neon sign, staircases, and much more. They boast an in-house crew trained in the safe removal of valuable and reusable materials. 912 Canal Street, Philadelphia. 215.925.2002 or info@ phillyprovenance.com. Philadelphia Salvage Company’s salvage, refinishing and restoration operation spans 25,000 square feet at two locations, one of which serves as a reclaimed lumberyard. New inventory comes in every day. In addition to the furniture, flooring, shutters, sinks, lighting, doors, hardware, cabinets, and all manner of antique knick-knacks, the four-year-old company offers deconstruction and demolition services with a goal of zero waste, dipping and stripping of doors and trims, and more. There is even a “Thirsty Thursdays” event from 4-7pm each Thursday where beer and bourbon are on the house, at the main location, 542 Carpenter Lane, in the Mount Airy section of Philadelphia. 215.843.3074 or philadelphiasalvage.com. New York Old Iron is along the Gowanus Canal in Brooklyn and has salvage that comes mostly from Brooklyn, Queens, and Manhattan. 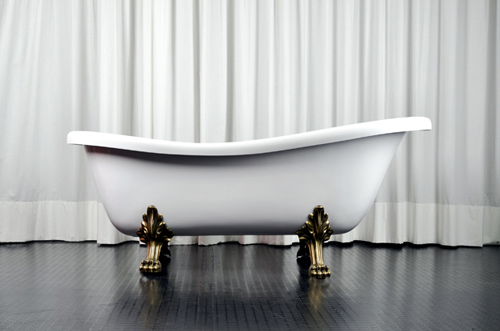 Everything is negotiable here, from hardware to clawfoot tubs to stained glass windows. Scrap metal and iron are the specialty, but there is much more to this yard located across from Lowe’s. You might find some old mannequins propped up among the pillars and sinks and chairs awaiting their new owners. 118 2nd Avenue, Gowanus. 917.837.3039. Hobensack & Keller in New Hope, Pa. is the place for unique antiques including iron gates, Oriental rugs, and vintage garden statuary. Local architects and designers swear by this treasure trove, which has been around since 1957 and is old-school, which means no website. Visit them at 57 Old York Road, New Hope, Pa. 215.862.2406. Green Demolitions specializes in recycled, high-end kitchen and overstock items rather than architectural salvage. The nearest showroom is at 275 Route 46, West Fairfield. 862.210.8332 or greendemolitions.com.